Tyler George (photo by Anil Mungal) steps away from competitive curling; will be replaced by Chris Plys on Team Shuster for 2018/19 season. STEVENS POINT - Tyler George has decided to take a break from competitive curling after reaching the pinnacle of the sport - winning the Olympic Gold Medal with Team Shuster at the 2018 Winter Olympics in Pyeongchang, South Korea. "It's been a long road of a long season and when you play as much as we have it takes a lot of time and wear-and-tear on the body," said George. "I've played down for 20 straight years with one minor break. It just seems like the right time to step away for a little bit and recharge the battery, let my body heal. Maybe I'll come back stronger down the road - only time will tell." 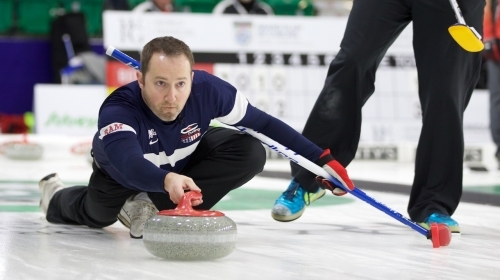 Tyler has been a member of Team Shuster since the 2014-15 season when they formed as part of an independent team outside the High-Performance program with John Shuster, Matt Hamilton and Trevor Host with John Landsteiner coming on board to replace host later in the season. The Shuster team won the USA National Championship and earned the Worlds berth in their first year together, earning their way back into the program. George represented the United States at the World Championships again in the 2015-16 season winning bronze and then won their second National Championship together in 2017-18 going on to finish fourth at Worlds that year. "At the end of our first season together it felt like something really big was happening. It was a really special four years as a team. I think that is something that we'll have forever. I respect every person's choice to do what's best for him and this is something that he's put a lot of thought into. I respect the heck out of that," Shuster said of George's decision. "It was an awesome time together." For Team Shuster, the departure of George leaves a big hole in the lineup. Chris Plys - also of Duluth - comes on board at third seems to be a natural fit. "I can't imagine joining a team that's coming off winning an Olympic gold happens all that often," Plys continued. "It's great that they are at my club, so it will be nice to be able to practice together. Getting to play with Hamilton again is fantastic. I never thought it would be a possibility. I have a lot of respect for John [Shuster] and the player he's become. I never had the chance to play with Lance [Landsteiner] and am looking forward to that as well. I hope I'm able to slide in seamlessly and bring a lot to the team." Plys - 2008 World Junior Champion - is coming off a tough season which saw him lose the Olympic Trials final to Shuster and then the National Championship final to Greg Persinger playing third with Heath McCormick. Plys spent the last two season curling with McCormick, Korey Dropkin and Thomas Howell. "Two years ago, before I started playing with those three, I was ready to step back for awhile and those guys brought back the fun for me," said Plys. "They brought a lot of shot-making and new friendships. I enjoyed my time playing with those guys."